I want to try an experiment. I think there's an interesting bit of content in here, but in exchange, I would ask that you maybe throw me a bone and answer a question or two in exchange. In any case, I need help figuring out the best way to explain the trends going on in eLearning. I'm going to put in my current figure, but I'm not happy with it or necessarily how I'm presenting it, so I'd like some feedback. The basic trend that I see in eLearning is that we've really started down a couple of new paths that I've label eLearning 1.0, eLearning 1.3 (I'll explain that in a minute) and eLearning 2.0. My first problem is that the labels include the version number that implies that we simply get rid of the old version when we upgrade. That's not really the case. A better analogy is an Oven and a Microwave. Just because you have the new technology doesn't mean you cook everything in it. you still keep prior generations around? Okay, so now let me confess why I'm calling it eLearning 1.3. It's because that dang Clive Sheppard has patented "Learning 1.5" (Clive on Learning: Learning 1.5 - for those who prefer evolution to revolution). No, actually, it's because I think the distance from eLearning 1.0 to eLearning 1.3 is shorter. Question 2 - I know that some people hate the term eLearning 2.0, but it seems that this is better than any alternative I've heard. Any suggestions on what to call the columns? Maybe the answer to Question 1 would help. In the eLearning 1.3 column, I'm trying to represent a lot of what is happening today in corporate learning. While we've not really let go of eLearning 1.0, we are being forced to build learning more quickly, in smaller learning bursts and often can be accessed as reference as well as up-front learning. Many times the SMEs are doing some of the content creation and definitely more maintenance. Because of that we're using fewer desktop based authoring solutions and moving towards web-delivered authoring. My guess is that most folks in corporate eLearning can identify with the above trends. Here's where it gets trickier. LMS - Some folks have gone away from the LMS for a big chunk of their learning. Thus, delivery of content is initially through email and then through the intranet on an on-going basis. Other folks keep their eLearning content under the LMS. Clearly by the time you get to eLearning 2.0 with user generated content, the LMS has to change. Further the trend in Web 2.0 suggest that lightweight solutions win out over more complex, controlling kinds of solutions like an LMS. Question 3 - Is the use of the LMS important to understanding this trend? Does it matter that there's been somewhat of a backlash and I expect that to continue? Collaborative Learning - There's definitely a trend (as pointed to by Clive as well) in using collaborative tools as part of what is otherwise an eLearning 1.0 kind of solution. This is certainly not eLearning 2.0 and not really eLearning 1.3 by itself. But, it seems like it heads you towards thinking about learning occurring through peer interaction and helps you move towards eLearning 2.0. Thus, I've included it in the eLearning 1.3 column even though that really feels not quite right. Question 4 - What should I do about Collaborative Learning? Finally, I'm trying to convey in the last row the changing role of Training in each of these approaches. I've tried a bunch of different analogies and not found one that I like. Currently, I say Gourmet Chef because we get an order for some really great learning and pull together the best ingredients and create something really spectacular (actually I've probably not been a gourmet chef since 1993). Short-order cook because we still take orders, but people expect it fast and cheap and they are going to eat quick. Food critic because we don't even create the content any more but we do help people make sense of content that's being created. Realistically, the dramatic shift between eLearning 1.0 and 1.3 is changing to being responsible for tools and process that SMEs can use to create content. In eLearning 2.0 we do that as well except for it's end users creating content (hopefully they are SMEs too). But we also add the responsibility for aggregating the content into helpful guides, etc. Question 5 - Is this analogy helpful? Would you ditch it? Change it? That's it. I'm really hoping I'll get some feedback on this. 1 & 2) I would use eLearning 1.5, rather than 1.3. Don't think of the .5 as a time. Versions usually don't indicate time frames. Think of 1.5 as the minor upgrade before the major upgrade (2.0), which is usually how it is used. As far as the 2.0 is concerned, I think it makes perfect sense, because eLearning 2.0 is about bringing the benefits of Web 2.0 to eLearning. Really, eLearning 2.0 is simply the ripples of Web 2.0 reaching eLearning. 3) I don't think the problems with the LMS are really 100% of the LMS vendor's faults. If we had better standards, there would be less complains about the complixity of LMSes and vendors could innovate more rapidly. With proper standards, it should not be much harder to write an LMS than it is to write a good blog tool. People will always need a place to store their content. People will always need a way to give assessments and track results. If the LMS goes away entirely (which I doubt will ever happen because of the massive amounts of money spent on these systems), it will be a shame. So, it may be contrary to what a lot of people are thinking or wanting, but I see a lightweight form of the LMS as a vital part of eLearning 2.0. We just might call it something different because of the bad rap the term has been given. 4) Collaborative learning is important, but I think a lot of the hype is overblown. Experts are very smart, motivated people, so they naturally think everyone is like them. However, I tend to think that the simple reality is that most people really don't care enough about their jobs to generate any content (subtract those who can actually communicate from the list and you have even less). Learning as we have it today is like a labor union. You have someone in charge of telling people what to learn, someone in charge of teaching, and everyone else does what they are told. Yeah, labor unions might be totally inefficient and lead to all sorts of laziness and other problems, but a lot of people are just there to pick up a pay check so they could care less if they aren't making a lot of impact or helping the company out. Companies without the additional burden of having to consult the labor union or wait on union repare men might be a lot more flexible, but that doesn't mean all workers want to give up the benefits and security that their union is providing them just so that the company can better itself. That said, collaborative learning is important and we will see a lot of benefits from collaboration in the future, but to suggest that eLearning 2.0 is pure collaboration is just plain nonsense. Without the passion, collaboration isn't going to be as useful. Unfortunately, passion is a lot harder to build than software and tools, so if companies plan on making use of collaboration in the tomorrow, building passion today is the best place to start. I think you are right that the current picture gives the impression that one generation supersedes the previous one, when it actually supplements it. I don't have a better technology analogy, but I am not sure that's the best to look at it anyway. The way I see it, all the technology does is facilitate ways of learning that we have always being using. We have always learned through a combination of formal courses, reference material and on the job. Roughly speaking e-learning 1 uses technology to facilitate formal courses; 1.3 to facilitate reference; and 2 to facilitate on-the-job. This, by the way, illustrates one of the reasons Wikis and blogs can fail as learning tools. They don't work if they are there just for learning - they have got to be there to help people do their jobs - the learning is almost a by-product. The LMS issue is really interesting. At its core an LMS does two things: deliver and track. It is easy to see how in principle a piece of centralised software can help do this for formal courses. But the role of the LMS will have to change fundamentally for e-learning 2. It has to be integrated into the workplace and workplace software. I don't think anyone has got close to this. The culinary analogy doesn't work for me. 1) Short order to me implies junk food. 2) I didn't get the food critic bit at all until I read the explanation - so I didn't help me understand. Jesse and Mark - your comments are quite good. "Roughly speaking e-learning 1 uses technology to facilitate formal courses; 1.3 to facilitate reference; and 2 to facilitate on-the-job." - that's cool! Wow, the LMS is a difficult one - something I've posted about before, but clearly I've only scratched the surface. I'm going to have to think about this one some more. Mark - grocer does mean something in the US, but maybe not the same thing because I don't get that one. I do like the Kitchen Designer analogy. I am not sure about phone, mobile, IM. One day I think my mobile will totally replace my land line. Also - any technology analogy is going to give the impression that it is all about technology when it is actually about different ways of learning. Instead of grocer you could say "food retailer" or even "farmer's market" - anyhow supplier of ingredients - hopefully of good quality. Does this work? Question - how do you evaluate each type of learning? Does it change? (I think it does). BTW "quite" is a word that does have different meanings in the USA and the UK. Over here if something is "quite good" we mean it's OK but not outstanding. The mobile aspect could fit in any of the versions depending on how it is used. A lot of content, such as what HotLava pushes out, is basically WML type page turners, fitting in the old 1.0. We have done a lot with text messaging campaigns bringing in some field and interactivity (1.3) and we are currently looking at having WiFi access to personal wikis via mobile phones for employees to access training notes, bookmarks, and virtually network training information. Q1: I like telephone analogy. But I've thought about other analogies that are similar. For example, you have a car radio with only AM/FM... then you buy a new car stereo, but this time you get a CD player (plus it still has AM/FM)... now, you get ANOTHER new stereo and it has iPod capabilities (or XM or something), but it still has a CD player and AM/FM. Turning that toward the e-learning analogy, AM/FM is pre-programmed by professional "Program Directors" and you get little choice in what you hear (ie, elearning 1.0). In many markets you may only have one classic rock station, so if you want to hear The Eagles, you have to tune in there and hope they play some. With a CD, you can grab your Eagles CD and play it any time you want... but you only have 12 to 15 songs to listen to, and those songs were chosen by the artist/producer/etc (elearning 1.3). But you can skip any songs you don't like, and repeat songs you do, at any time. With the iPod, you have an immense collection of music at your fingertips, and you can listen to any artist/song that you've decided to load into your iPod (elearning 2.0). With a 60GB iPod, you could technically have all of your CD/mp3 on there, and have a near endless supply of entertainment. Q2: eLearning version numbers don't bother me. They give a definite idea that things are new. If anyone is familiar with software, they know that IE6 is basically the same as IE5, but just a bit different... and hopefully better. Q3: Here's where I think "theoretical" eLearning and "real world" eLearning differ. I've found that most companies usings online training still have some kind of LMS, and those that moved towards E-mail or even CD-R distributed learning are doing so because it's simpler... not out of any great ideological progression. The "bosses" want to know that eLearning isn't a waste of money, and the only 2 ways of showing objective results are testing and increased work performance. LMSs won't go away...they'l just adapt to the current needs. Q4: Any training worth a damn is collaborative. Or at least it should be. I'm stuck in eLearning 1.0 hell... but eventhough we use SMEs almost exclusively, we try to include information from the people "in the trenches" whenever they see something amiss. Q5: Another analogy I thought of: 1.0 is like a tour guide... they have set destinations and a set script, and once you pick a tour, you have no control of what happens. 1.3 is like a chauffer (or cab driver, etc)... you tell the driver where to go, but they decide the best path to get you there. 2.0 is like a traffic cop... you decide where to go, you decide how to get there, but the cop makes sure you do it in an orderly and lawful fashion. Quite right about "quite" ... even after working with a client in the UK for a number of years, I've never mastered UK English. I did mean the US version of comments being very good. Love the AM/FM, CD, iPod analogy for your car! I think I will continue to call them 1.0, 1.3 (or 1.5) and 2.0, but then explain that you still keep the previous stuff just like in your car stereo. Still really liking - course, reference, part-of-the-job. I'm realizing from the comments that I'm going to want/need to describe when we classically use each type of approach and that many learning solutions may fall across. Scary question about evaluating each kind of learning because while you theoretically evaluate Level 3 & 4 on all of them to see impact - because you don't know the desired performance in the eLearning 2.0 world, awefully hard to evaluate except at a macro level. This deserves discussion all on its own. Not sure I get what the row would look like that was "evaluation." Mobile was mentioned and I agree that it's really independent of this discussion. The delivery platform (PC, thin client, tablet, mobile phone, etc.) can be involved in all of these approaches. Of course, if you have wireless Internet + mobile devices everywhere, then we can look at creating solutions that don't require as much up-front learning - thus, more reference oriented. There is some real dissention right now about the value/utility of LMSes. I'm still thinking about that - but it's clear from the comments that this is ripe for disagreement and that it's going to be a sore spot as we look at 1.3 & 2.0 solutions. Based on one comment, I think I should clarify what I meant when I wrote collaborative. I was thinking of collaborative learning activities (involving multiple learning participants together to learn a topic). To me this is heading in the right direction (towards teaching people how to learn on their own and with the help of others), but it's still in a controlled setting. eLearning 2.0 is pure collaboration but bottom-up. I like the "tour guide" analogy - not sure about chauffer, and traffic cop. City Planner is kind of right for eLearning 1.3 in that you can go anywhere - there's more freedom for the user. At the same time, for some bursts you have to follow the rules. But then I get lost on what the analogy is for eLearning 2.0. Again, thanks for this help! I'm not sure the phone analogy really adds anything. It is far seperated from the actual issue, so drawing a meaninful connection between the two isn't all that easy. I think a better understanding of what is going on could be made by drawing on the history of publishing and how weblogs are changing the publishing industry. We are at a point, call it publishing 1.5, where weblogs are taking off as a means of communication. In fact, they are taking off so much that the mainstream media and traditional news outlets and book publishers are really worried. There are a lot of folks who like to theorize that one day all our news and information will come from blogs and no one will read the newspaper anymore, but I'm not one of those people. In the same way, eLearning 2.0 to many experts is this ideal where users create all the content and the traditional methods of delivery and content creation have been abolished, but I doubt that will ever happen either. For clarification, in my last analogy, I was viewing the student as needing to get from point A to point B -- or "NOT knowing something" to "KNOWING something". The tour guide (the ID) tells the student exactly what he/she needs to learn, and how they should learn it. If 20 students go through the course (the tour), they all the get the exact same information. The chauffer (or cab driver) allows the student to choose their own path, but they take them on the route that they think is best. It kind of messes up the grid that says the "Driver" is the "Learner", but I would say the Learning is actually the "destination chooser". The traffic cop doesn't tell anyone where to go, or how to get there. At that point, the students are able learn what they want and when they want... they can take any route... they can detour... and they're all the road together. The traffic cop only serves to make sure that there are no wrecks -- the student is actually able to learn what they want, and there's nothing blocking the way. And if a student becomes an impedemant to other's ability to learn, the cop can pull them over and give them a "ticket". A crude model is that as you move from formal through reference to OTJ then you can drop the lower Kirkpatrick levels. So when you have a formal course then it makes senses to ask what did you think of the learning experience because that was something that was created for you as a learner. Of course you still need L2 and L3 as well. When you move to reference L1 no longer makes sense because the learner makes their own experience. However, they are not working so it still make sense to ask L2 questions. Did this give you the skills/knowledge you were looking for? Finally when you move to OTJ it only makes sense to ask L3. Is this blog/wiki helping you do your job? The learning is incidental. Maybe this is over-neat - but it could make a pretty diagram. HowCron - thanks for the clarification - I get how to use the analogy now. A little farther to go than for the AM/FM, CD, iPod adaptor, but I think it may help. I'm going to have to try it a couple of times. Mark - your comment is interesting because I agree that we will likely drop L1 feedback once we leave eLearning 1.0, but I'm not sure that's right. Shouldn't we continue to survey folks to find out if they feel that the resources or guideance are helping (in their opinion)? On the other hand, most corporate initiatives don't include L1 eval, so why should we be different? L2 is much harder in that there is no longer a common set of knowledge that you can test (except how to use the systems/tools). So, L2 does go away in eL 1.3 and eL 2.0. Of course, in eL 1.3 and eL 2.0 I'm not sure that we've defined common performance. So can we even eval that? We can find out if they are using the reference or the tools. But, since the performance is fairly open, how do you evaluate it? The problem about L1 evaluation once you leave formal training (I am determinedly sticking to my way of looking at it :-)) is that the learner controls the experience. So, if as a trainer, you get a bad L1 feedback there is not much you can do about it. Take a reference level example. Suppose you set up a service like NETg safari books or whatever the Skillsoft alternative is for your IT guys. You can ask the users to rate the items but how useful is that unless you know why they wanted to use them and the context round it? Did they read it on the train? What skills did they have before they read it? Was it in their native language? Mark - your example is right on point and some well-known reference systems (e.g., Microsoft Developer Network) allow you to rate the resources. Although, they are doing it with the intent of helping to identify more valuable content. We could also imagine that we would ask questions that are aimed at the broader set of resources along the lines, did you find this reference system helpful? Do you feel you found (learned) what you needed to know? I agree that without the context of who was using it, with what purpose, etc., you are going to get very different kinds of responses that might not make it all that meaningful. Of course, you also have that issue with L1 evals in any course or presentation - students have different backgrounds and expectations - so it's easy to feel that some (the low ones of course) of your evaluations are of the category of "there's not much you can do about it." So, I'm afraid I may be sticking to my original opinion as well. While we likely will not be doing as much L1 in practice, you CAN (and should) still do it and get some amount of meaningful feedback. You will informally anyhow. You'll ask your users if they are finding it useful / helpful. Now that I've written all of this, I'm also realizing that there's not much of a leap from what I consider L1 evaluation to L3 evaluation in this context. If you ask them if they found it useful, isn't that almost the same thing as asking whether it helped them solve the problem on the job? Hmmm ... I may need to reconsider if this is L1 or L3 or is it confusing when the "training" is indistinguishable from the "performance"? Full Streaming Video, pictures, training like no other. Over 2500 terminals are installed. 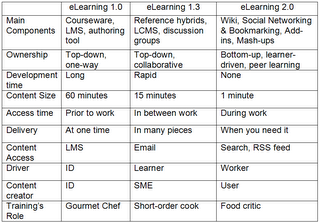 I drew a little map to illustrate how I think elearning, elearning 1.3 or 1.5, and elearning 2.0 co-exist. See it at www.rathergraphic.blogspot.com. Notice the relative sizes of the training department and users (learners) in the illustration. I don't like 1.3 or even elearning 2.0. Isn't is just learning? I do like the chef, cooks, and food critic analogy. Chef implies that training is the expert and controls the kitchen; cooks represent the collaboration between a training department and learners; food critic means that the learner is responsible for judging the quality of the "training" they consume and empowers them to pick and choose according to their needs and tastes. I rather like the analogy of a Sculpture - As Ithe ID must be use the content - alot of which you have discussed these days comes from the SME or similar) we may add a little such as the water. We like many artists have our favouraite tools and techniques (models,frameworks and personal preferences) and must produce a piece or project that reflects the outcomes required, meet sthe clients expectations. So all in all we must produce - given restricted resources, sometimes tight specifications, with an array of tools (this is where our scope lies) a master piece.